Liveright Publishing Corporation, 9780871407887, 288pp. We've all been there: faced with a major decision, yet overwhelmed by the very data that is supposed to help us. It's an all-too-common struggle in the digital age, when Google searches produce a million results in a split second and software programs provide analysis faster than we could ever hope to read it. - What's the question? Analysts often believe that questions are self-evident, but focusing on better questions up front always yields better answers later. - What are your "drivers?" The human mind has a hard time juggling information, so analysts need a system to break down complex questions into different characteristics or "drivers." - How will you measure performance? Once the question has been solidified and the "drivers" determined, an analyst must decide what metrics they will use to understand how a problem--and their solution to it--is evolving over time. - What about the data? Rather than looking at each bit of information on its own and up front, an analyst can only overcome data overload by plugging data into their "driver" categories and excising anything that doesn't fit. - What are we missing? Complex analysis isn't easy, so it is imperative to assume that the process is flawed, while also knowing how to check for possible gaps and errors, such as availability bias, halo effects, and intuitive versus analytic methodologies. Drawing deeply from his own harrowing experiences--and mistakes--in the line of duty, Mudd has spent years refining and teaching his methodology to Fortune 500 companies and government organizations. 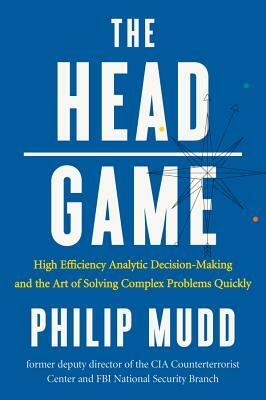 Now, in the best-selling tradition of Charles Duhigg's The Power of Habit and Oren Klaff's Pitch Anything, Philip Mudd's The HEAD Game can change the way you both live and work.